On N. Glebe Road between Fairfax Drive and Wilson Blvd. Chef Nelly and his culinary team hand-craft their delicious Bistro Soups from scratch daily with only the finest ingredients! Just ask your server! From Jumbo Lump Crab Cake Sandwiches, the finest Filet BLT's to seasonal favorites, just ask your server about today's Signature Sandwich! 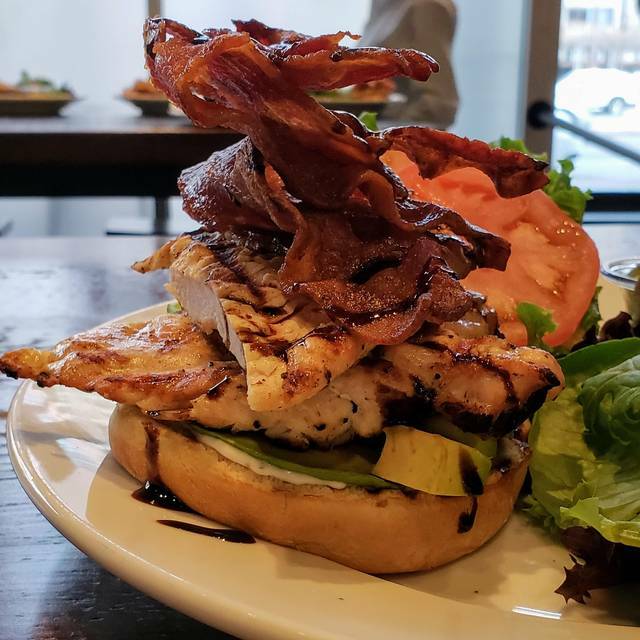 All of our Crew Favorites and Roadie Recommended Sandwiches, Wraps, Paninis and Burgers are made with the finest and freshest ingredients and served with crisp deli-style pickles and your choice of Shoestring French Fries or Mixed Greens! Takin' it Down to Burger Town! Fresh baby kale and arugula, shredded parmesan and house-made croutons pair beautifully with our hand-crafted Caesar Dressing and if you so desire, anchovies! Very nice addition to the Ballston area. Great cocktails, hors d'oeuvres, salads and desserts. Entrees were high quality and substantial and while not inexpensive, the menu choices were well worth the price. Come early for a reduce price menu. And introduce yourself to the owner Mary. She's delight. Nelly and Mary really outdid themselves for our dining experience. A group (6) of us dined on a Monday evening and practically had the whole restaurant to ourselves. Mary made sure that we were given her undivided attention and ensured that each of us received the entree that we wanted. Thank you again, Mary and Nelly, for allowing us to share your culinary/dining talents with us. We will be sure to visit again! We had a mixed experience. The humus appetizer and happy hour drinks were a great value. Friday at 6:30 there were plenty of tables and it was a nice atmosphere if you really want to talk to others in your party. Not too loud. 😀. The burgers were good. Salads not so much. And our waitress while very friendly was pretty clueless. She brought the wrong salad, didn’t really understand the menu. She will make a good waitress if she gets more training. Nothing made us want to return and with so many choices around we probably won’t. Great service! Made the team feel special. Excellent food on lunch menu. We are definitely coming back when in the DC area. We absolutely loved the amazing food, the awesome staff (they made my kids feel important), and the awesome restaurant in general . If there was a rating higher than 5 stars, they would deserve it! The restaurant just opened a few weeks ago. I went there for dinner and we had the crabcakes and salmon. Both meals excellent. The wait staff was responsive and helpful. Only complaint I would have was the meal took a little too long from ordering to the arrival at the table. We can chalk this up to newness. Recommend you give it a try. The food here is exceptional. Sandwiches are delicious and there is great attention to detail in every meal! I made reservations here for a friends birthday. When I arrived, they had a paper on the table saying it was reserved for me and my guests. After the meal was over, they brought her a cheesecake (her favorite and it was delicious) and they customize it by writing happy birthday with her name on the plate. NICE TOUCH!!! She was very happy and everyone (all 6 of us) were thrilled with the food and the price. Thank you for your personal touch Stageplate Bistro!!! Hi Paula, Thank you so much for the kind words and review! Thank you for choosing Stageplate Bistro Arlington for your special occasion and we hope to see you again soon. It was amazing! They had a great happy hour specials and we plan to go back with more friends! We were seated quickly, the hostess was great. The service was a little out of sync. The ambience is great, however the food leaves a lot to be desired. The salads are generic although generous. The chicken breast is seasoned adequately though severely overcooked. The prices do not match the effort put into the meals. I would look elsewhere until they develop their processes. Love the location...so nice to have a good restaurant near my house that's quiet and with quality food that's reasonably priced! Loved the service! Good people! We celebrated Staff Appreciation Week with a group luncheon for one of our departments. Service was very good and portions were large. You can easily share most entrees. The food was delicious. We will plan to go again. Awesome spot right in the Center of Ballston. Contemporary American cuisine. Food is fantastic with very generous portions. This was probably the best meal I have had in the Arlington area. Restaurant was beautiful. Service was perfect and I have been thinking about this meal for days!!!! Mary the owner came out to check on us personally during our meal(definitely a touch you don’t get anymore). We will definitely come back again and again!!! Beautiful restaurant, tasty good food! Excellent food, great service, very generous portions - our first time here and all 3 of us had great meals, good drinks and enough leftovers for lunch tomorrow. The menu has a wide selection of salads and sandwiches, and a shorter list of dinner entrees. The smaller salad with steak was plenty, and the sandwiches are very large, so each of these made a full meal. Great place, highly recommend it. Once again my wife and I were exceptionally happy with the service, food, and atmosphere of the Stageplate bistro. We met the owner Mary who took care of us at the bar. Extremely nice. We are looking forward to the Spring when they bring Gospel Brunch to the area. We have been to Stageplate Bistro twice and have decided to become regulars! Chef Nelly and his wife, Mary are fantastic and eager to accommodate special requests. A member of our party is dairy intolerant and they went the extra mile to allow her to enjoy the menu without fear of stomach distress. The staff is friendly and attentive without being intrusive. We love the place! A great new dining establishment in Ballston!! really enjoyed the atmosphere and décor. Food was excellent, and service was immediate. The parking was easy (below the restaurant), though they did not validate parking tickets. Excellent dining in a relaxed atmosphere. They offered a great selection for restaurant week. It took a bit of time for the main courses to come out but our server and others were checking on us so we did not feel neglected. This is a welcome addition to the neighborhood. The menu is sophisticated and the quality of the food first class. It has an urban vibe that is energetic but not overwhelming. We plan to come back! We arrived to a welcome sign on our table, which was a lovely touch. The menu was limited due to the newness of the restaurant. The portions were large and reasonably priced. A member of our party didn't get her order until well after the others at the table were served. She was not charged for her inconvenience! Loved how they made up for their mistake. The service was slow but could be due to the low amount of servers and inexperience. That said, we will return! We had dinner at Stageplate with friends and are so happy to find such a quality dining experience in Ballston. The foods was delicious with very large portions and everyone so pleasant. We had the bacon wrapped shrimp, scallops and shared a spinach salad. All were outstanding and we would recommend them. The large salads are huge! They had a great play list and it was easy to talk while still enjoying the music. The waiter was very attentive and knowledgable, the menu has a good range of options and everything was delicious, and it was quiet enough we could talk. I would definitely go back. I met a colleague here for a mid-week dinner and it could not have been a nicer place. The people were attentive, the food and wine were wonderful and the interior was warm and inviting. I will definitely return with other friends and colleagues. What a great new restaurant in Arlington. It has a lot of potential. Will definitely be back!!! Tasty food!! Great customer service and excellent food. Everyone was happy with the food and service. Service was attentive, the food was excellent, and the portions were very generous. The only knock on them was that a few items on the menu were not available. A Caesar salad without anchovies is hard to find, and I'm glad I took a shot at it because it delightful. Every bite had Parmesan cheese, dressing was not too light or heavy, I could do without as many homemade croutons though. Went for a business lunch. The service was good as was the food. My only complaint was that the Caeser salad was over-dressed.